Parksville Part of the BC Adventure Network. Over a million web site visitors annually ! 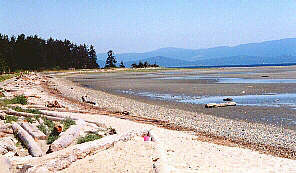 Here, at the beginning of Vancouver Island's Beach Country, the focus, naturally, is on the outstanding waterfront. This is the spot for beach vacations! On low tide days, the water recedes for hundreds of metres, leaving the hard sand beaches exposed for beachcombing and sandcastle building; the Parksville area sponsors a Sandcastle Competition which draws builders from around the world. The water, warmed over the hots sands of the beach as the tide comes in, makes for wonderful swimming. The water, however, is not just for swimming; anglers come from all around for exciting saltwater and freshwater fishing. Nature lovers will thrill to the arrival of thousands of Brant geese in April (Brant Festival) and the ecological reserve for wild rhododendrons at Rhododendron Lake. History buffs will be enthralled with the historic St. Anne's Church, the History Museum and the petroglyphs along Englishman River. Whether it is for camping, hiking, fishing, playing on the beach or exploring the natural wonders of the area, Parksville, BC, has something to offer everyone in perfect Vancouver Island vacations. Access: Parksville, BC, is located on the east coast of Vancouver Island, 37 km (23 mi.) north of Nanaimo, on Highway 19 or 144 km (89 mi.) north of Victoria. The area is also serviced by bus and rail. Accommodations: Visitors to the Parksville area may choose to stay in one of many motels, resorts or first-class hotels - many of them on the beach - or set up camp in one the private or provincial campsites nearby.